Are your considering a move to the beautiful coasts of the Carolina’s? Whether you are dreaming of buying anew, building from scratch, or simply dreaming, chances are you’ve done plenty of research in an attempt to discover what type of designs speak to you. At True Homes, we have extensive experience in designing tasteful and timeless designs that will last a lifetime. Let’s explore a few of the top design trends for coastal living. 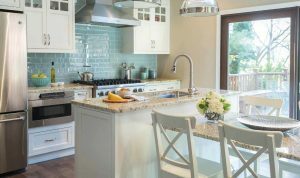 All-white kitchens have received mixed reviews in recent years, but in a coastal home, they still feel bright, light and classically tasteful. If you are worried about too much white, try throwing in a hint a contrast via a splash of wood. 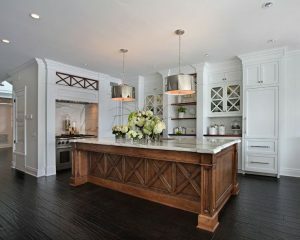 One of the most aesthetically pleasing trends as of late is doing a wood island mixed with a [white] stone countertop. The wood adds a softer texture to the overall feel of the kitchen which makes for a more comfortable environment. The durable stone surface also makes cleanup easy and is ideal for food prep. Recent design trends are certainly leaning towards open spaces in modern design, and with good reason. At a coastal location, this approach is especially helpful. Imagine your great room, dining room, and kitchen all seamlessly combined into one giant living space. This creates a seamless social environment where everyone can comfortably be together while still having their own space. The kids can play a game in the dining room, while the adults prep dinner in the kitchen, or watch a show in the great room. Did you recently purchase a True Home near the beach? Expect lots of friends and family knocking on your door. 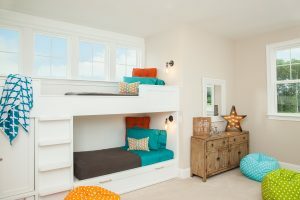 That’s one of the main reasons bunk rooms have been featured in coastal homes for decades. But more recently, it’s not just the kiddos that are using them. Elaborate bunk rooms have become more ubiquitous in recent years, and many are designed with queen beds on the bottom and full beds on top. And to top it off, these new bunks come fully loaded with full stairs that provide easy access, various USB ports, shelves, and personalized lighting for each occupant. You may think neutrals are always a safe bet when it comes to designing a home – and they usually are – but on the coast, spaces can benefit greatly from adding a hint of boisterous color. So, what’s the perfect way to add just the right pop of color without going overboard? Tile. Try including brightly colored tile accents through the kitchen and bathrooms. A little pop of color in that kitchen backsplash tile can play wonderfully with that wood and marble island you just installed. And a slight hint of color throughout that all-white shower tile can take a stark space and transform it into a vibrant morning experience. Just like we suggested adding bits of wood to help bring life and texture to that stark all-white kitchen, adding splashes of wood throughout the rest of the home an also help bring a dull space to life – especially if you are worried about not having enough warmth and contrast. You can feature wood walls with beautiful linen drapes, or coffered wood ceilings with painted drywall in-between. You can even get experimental and do a mix of painted beams with old wood accents. This can create and natural, organic look that delivers contrasting materials that are beautifully unique. Regardless of what your design goals are, True Homes is here to build you a custom home that satisfies all of your design dreams. Contact us today to learn more!